There's not much I can do in the kitchen that makes my husband happier than just roasting a chicken, especially if I also chop up and roast some sweet potatoes, yukon golds, shallots, garlic, and onion until they're carmelized on the outside...YUM. For roasting the bird, I rely on the method I learned from Barbara Kafka, in her wonderful book, Roasting-A Simple Art . IBarbara's all about high-heat roasting, fast and simple, and she has recipes for everything from meat to fruit using this method, and every bit of it is delicious. She credits "Simple Roasted Chicken" as being "the one that started it all." One caveat is that your oven needs to be relatively clean before you do this, or it's going to smoke. But hey--this gives you an excuse to clean your oven, which you probably haven't even thought about lately! Take your bird, rinsed and patted dry, giblets removed, place it in a shallow roasting pan (no rack necessary) and season inside the cavity thoroughly with coarse kosher salt and coarse-ground pepper. 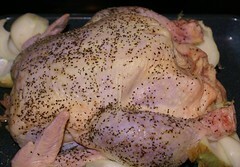 Pat salt and pepper all over the skin of the bird. Cut up a lemon or two and stuff them inside the cavity, along with chopped garlic and a couple of tablespoons of butter. If you're roasting root vegetables, set the chicken aside while you prepare them for cooking, because they'll take about as long as the chicken to cook (about an hour). 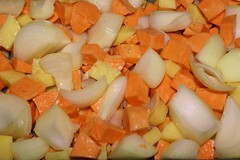 Roasted potatoes--again, easy-peasy: Chop up into 3/4" chunks, peeled sweet potatoes and Yukon Gold potatoes, with about a two-to-one ratio of sweet potatoes to white potatoes. Chop two sweet yellow onions into largish wedges. Chop garlic, or just used the pre-chopped, jarred garlic from the produce section of the grocery store. I also added chopped shallots this time around, which made the whole thing really nice. Once all the chopping is done, drizzle olive oil over everything--not too much, or the potatoes will be mushy (you can mix in a little melted butter if you want, for flavor, but it won't suffer without it), and toss to coat well, in a baking dish. DO NOT ADD SALT OR PEPPER YET. Put the chicken and the potatoes in the preheated oven, side by side on a lower rack, at 500 degrees. You read that right--500 degrees. Roast, uncovered, for about an hour. About 10-15 minutes in, shift the chicken around (give it a little shove with a wooden spoon) so it doesn't stick to the pan. Gently turn the potatoes every 20 minutes, and before the final 20 minutes of cooking time, salt and pepper the dish, tossing to coat. I like to use coarse salt and pepper so I can better see where it's going. The chicken is done when the internal temperature is right or when juice from the thickest part of the thigh runs clear. If the skin starts to get overdone toward the end of the cooking time (it shouldn't), tent some foil over the top to keep it from burning. The potatoes are done when they're tender, and the potatoes and the onions/shallots should be carmelizing nicely around the edges, turning dark brown. Remove the chicken to a platter to rest, and for carving. This bird was fork-tender, and perfectly cooked throughout after one hour, without a bit of dryness. The lemon flavor had permeated the meat, and no additional season was needed. The skin was golden and crispy, with most of the fat having melted away. 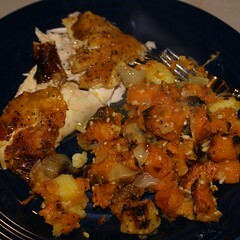 The vegetables were perfect, too, with just the right amount of carmelization from the starch in the potatoes. While we had plenty of leftover chicken, there wasn't one SCRAP of leftover veggies. If you want to make a sauce for the chicken, skim the fat off the top of the drippings in the roasting pan, then place it on the stovetop to cook, deglazing the pan with wine, fruit juice, or chicken stock or broth. Cook down to desired consistency, or add a sprinkling of flour to thicken. And you're done. Easy as can be, and you're a hero in your own kitchen. 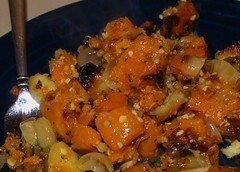 This is a great dish to serve for company, too, because it has such a BIG impact with so LITTLE effort! Plus it has the added appeal of not being very labor intensive--once you've done your prep-work, that's pretty much it. You just pop the whole thing in the oven and then take it out and amaze everyone with your Norman Rockwellian meal. This sounds like the perfect meal to please my hubby as well. He loves meat and he loves sweet potatoes. I'll have to give this a try! Thank you! I could totally see serving this with the homemade bread... it looks so good. Of course, lots of herbs complement this, but this was about SIMPLE. And I forgot to add to put the bird in the oven legs-first. That way the hottest part of the oven is at work on the dark meat. Making this right now and dang the house smells goooood! We didn't have sweet potatoes so I went with carrots and parsnips, which the kiddos love. please a man AND your bloody picky best friend. 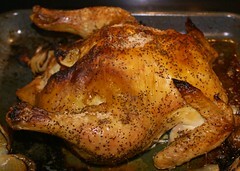 i had never roasted a chook before and this was yummo! soooo easy. mind you i didn't take your advice and clean the oven first ... hrm smoke everywhere. lucky it's warm here in Aus. i just opened the windows and shared the yummy smell with the neighbourhood hehe. p.s. little poodle crosses love quick roast chicken as well! How many were you? I'm wondering if this would serve 4 adults and a child that eats like a bird? It sounds fantastic!! NOT throwing in the towel. Because sometimes a hot bath ain't gonna cut it. Hi, My Name Is Sisyphus, And This Is My Boulder.